It’s usually February when I start waiting for tomatoes. I refuse to buy those tasteless, artificially ripened supermarket tomatoes through winter and hold out for sun-ripened fruit. I water, stake, and trim my garden vines as the summer’s heat drives their tropical genes into rapid production. The tiny seeds quickly became four-inch plants, and within six weeks of good weather they grow into small trees heavy with green fruit. When the first rosy cheeks appear, I know their harvest is near. Soon baskets of tomatoes spill over our farmers’ market stands, and several bowls of ripening tomatoes line my kitchen counter. When the season finally arrives, we don’t want a day to pass without at least two tomato preparations on our plates. Fresh local tomatoes stay with us from August until October. Vine-ripened tomatoes, crusty bread, a little garlic and olive oil join forces in a classic Italian salad. Is there anything better than good bread sopped with fresh tomato and drizzled with fruity olive oil? Before I get into assortments of sauced, stuffed and stewed tomatoes, I’m ready for panzanella. 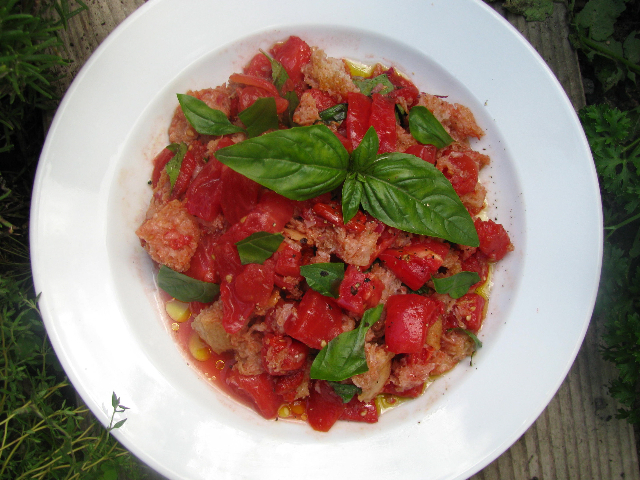 Most recipes for panzanella use a lot of bread and a couple of tomatoes. I choose the opposite combination with lots of tomatoes and just enough bread to take up the juice. The tomatoes must be full-flavored and dead ripe. The bread should come from a crusty baguette or peasant loaf. The usual suspects enliven the mix: garlic, olive oil, red wine vinegar, onion, fresh basil, roasted red pepper. I can hardly wait any longer. Toast bread cubes lightly until crisp and golden on edges but not hard; 300° for 10–12 minutes. Turn off the oven and let the bread dry a bit longer. Scald tomatoes in boiling water 10 seconds. Core, peel, cut in half at equator and gently squeeze each half into sieve placed over bowl. Rub tomato seeds with back of ladle to extract juice. Discard seeds; save juice and cut tomatoes into chunks. The result should yield 4 cups tomato chunks and 1 cup tomato juice. In bottom of large bowl, mash garlic with salt. Whisk in vinegar and olive oil. Add tomatoes, onion and bread. Drizzle in just enough tomato juice to soak into bread. Allow mixture to stand an hour adding more tomato juice if needed. Before serving, mix in fresh basil and/or parsley. Taste for seasonings, adding more salt and pepper and a dash of balsamic vinegar if desired. For extravagance, drizzle top with another spoonful of olive oil. Serves 4. Note: This salad may be further embellished with peeled roasted red or yellow pepper strips, cucumber slices, black Greek olives, whole anchovy fillets, or shaved Parmesan. You are currently browsing the Mary Jo's Kitchen blog archives for August, 2011.